the island of Tahiti. It is the primary center of Polynesian public and private governmental, commercial, industrial and financial services as well as the hub of tourism. Papeete was first settled by British missionary, William Cook, of the London Missionary Society in 1818. 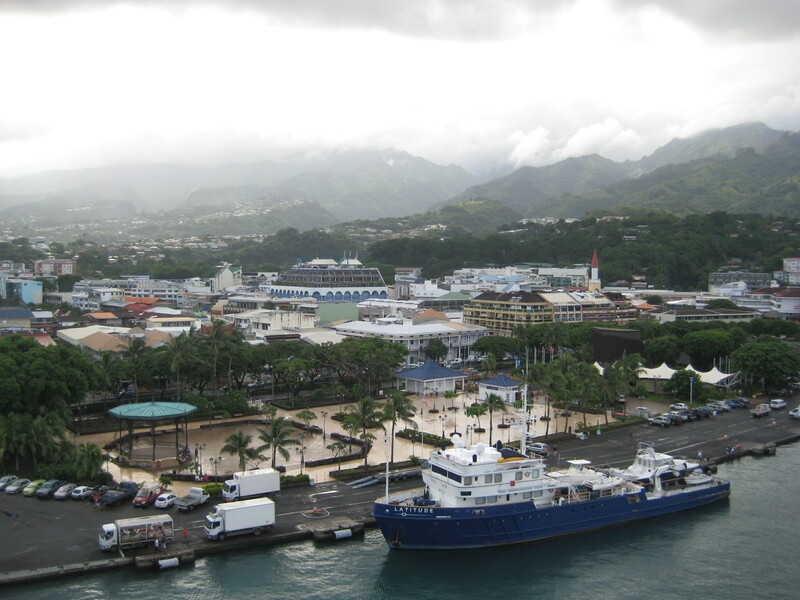 Queen Pomare IV moved her court to Papeete and made it her capital in the late 1820’s and the town grew into a major regional shipping and transportation center. France took control of the Tahitian islands and made them a protectorate in 1842. We took a tour of the island today called “In the Footsteps of Gauguin”. Paul Gauguin journeyed to and toured Papeete in 1891. He stayed for a couple of years before returning to France to sell his art. After not much success in France he returned to Papeete in 1895 spending time in the area until his death from a heart attack in 1903 at the age of only 55. The Gauguin museum is in poor condition and is getting ready to close for a five-month renovation project. It features a retrospective of the artist’s life in the islands through letters, writings, documents and his household items. There are many copies of his work represented but no originals. Also on the tour we visited the Museum of Tahiti and Her Islands in the residential district of Punaauia, which has an excellent collection. There were wonderful items related to local culture, traditions, geography as well as a lovely tropical garden right at the water’s edge. 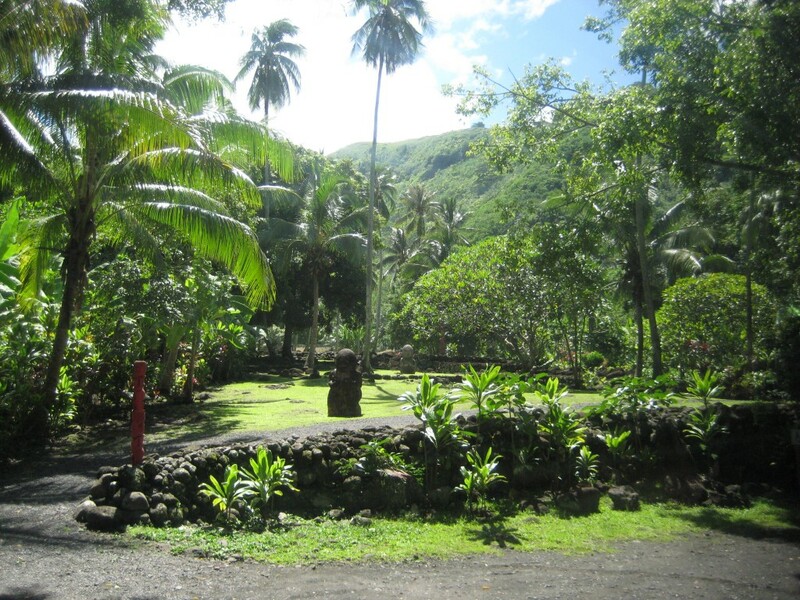 Along our journey to the Gauguin Museum we stopped in a beautiful lush valley filled with lush vegetation and enormous plumeria trees covered with fragrant white blossoms. A valley at Arahurahu is where we visited a Marae, which is a Ceremonial meeting place. Here we saw two human-like statues, which are very similar in style to the statues found at Easter Island. They are much more human like with less exaggerated features and were much smaller in size. The statues could also represent women where the Easter Island statues only represented men. At this site there was also a stage area created out of volcanic rock, which was used for religious ceremonies and festivals. Archery was a sacred sport, which called for human sacrifice. There was a high platform where sacrifices, including humans, were performed. This practice was abandoned when the missionaries arrived. They also used this area for festivals and civic events. It is a Sunday so most everything is closed today. The downtown area near the port is very well developed and where many of the hotels and resorts are located. Many of the buildings are in poor condition and are in need of paint and repairs. Graffiti is very common throughout the island. Many of the homes are poorly constructed, dated looking and also in need of repairs. There appears to be little new construction and our guide told us that even Hilton and Sofitel recently closed their hotels due to the lack of business. When we returned to the ship a local Folkloric Show was presented as the night’s entertainment. Looks like u gents are having a fabulous time!!! Wish we were stow-a ways. Love the blog of all your adventures – between ur morning, noon and night activities and ur great blogging…when r u sleeping?? Tahiti (Bora Bora and Moorea) has been our favorite destination to date on our meager world travels :-). Happy belated b-day to Sweedie!! Love to u both. Laura & Jim. Looks like you are having a great time.. We are all jealous at the office.. Almost a month at sea. Glad you guys are enjoying the trip. Hope one of you mastered making those crabcakes.Look forward to tasting them on my next visit to San Diego.Hopefully you enjoyed Bora Bora more than Tahiti.